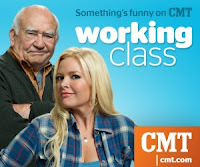 "WORKING CLASS focuses on Carli Mitchell (Melissa Peterman), a single mom from a rough and tumble background, trying to give her kids a better life by moving them to an upscale suburb. She quickly finds that making the transition to “the good life” is harder than she thought. She's unwittingly befriended by her cranky neighbor, Hank (Ed Asner), her only “career” prospect is a glorified deli job at the local grocery store, and the man she falls for not only already has a girlfriend – but he’s also her boss, Rob (Patrick Fabian). With her ladies-man brother, Nick (Steve Kazee), to help her out (when he’s not acting like one of the kids himself), Carli faces the challenges of parenting, dating, and making friends in her new community by doing more with less, staying true to herself, and approaching each day with a touch of working class." Review: I don't want to give anything away but this show is going to be really good. It is great to see it be close to reality of what times can be like especially as a single parent trying to get by and raise a family. Melissa Peterman is funny and does a great job in playing Carli, I loved her on Reba and she will be great on Working Class. I like that she works in Parker Food's deli, since my son's name is Parker. If you were a fan of CMT's Reba you will want to check this out for sure. I am looking forward to the next episode to find out what happens to Carli next. Looks like this will be a fun, lighthearted sitcom for the family. Where to Connect: Check out CMT for everything Working Class along with Facebook and CMT on Twitter.